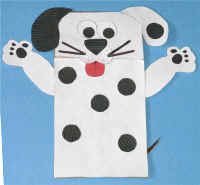 You can make a Dalmatian type dog like the one in the picture or use different colors for a grey, brown, tan or black dog. Or even your own Peggylicious dog with floppy ears! Print and cut out the templates show below. Glue the muzzle (upside down heart shape) onto the had. It should overlap the body a bit. Glue the tongue so you can see part of the circle sticking out from under the muzzle. Glue two whiskers (long, thin rectangle pieces) onto either side of the muzzle. Glue as many spots as you like to the puppet. You can put them on the front, back, ears or face. Fold the tail in half (so it’s colored on both sides). Fold the dotted line tab and use this to glue the tail onto the back giving it a 3D effect. Glue as many of the extra spots as you like to the puppet. You can put them on the arms, front, back, ears or face. Template 1: Click on the image to enlarge. Once the image is open, you may need to click on it again to make it even bigger before printing. Template 2: Click on the image to enlarge. Once the image is open, you may need to click on it again to make it even bigger before printing. When you’ve made your dog why not send us a photo and we’ll put in on the website. This is brilliant – I’m going to pin in.